Chocolate offers up so many rewards. Relax and enjoy yourself. Let the flavors unfold. Enhance the pleasure by taking the time to mindfully savor each bite. Engage all of your senses for a full chocolate experience. Our eyes devour beauty and whet our appetite. 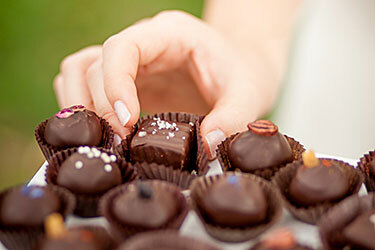 For many, the mere sight of chocolate creates excitement and anticipation. What does its appearance tell you? Is the chocolate shiny or dull, reddish or ebony-dark? Chocolate comes in a range of colors, dependent upon the type of beans used, its regional origin and how it was processed. Let your eyes ignite your imagination. Chocolates are best enjoyed at room temperature. If you’re tasting a solid piece of chocolate, rub a small piece of the chocolate between your thumb and index finger to warm it slightly. Now hold the chocolate up to your nose, close your eyes and breathe in the aroma. Is it delicate? Penetrating? The senses of smell and taste are intertwined. Chances are, your mouth is beginning to water as you anticipate the flavor. As you bite into the chocolate, listen to the clear snap – like a twig underfoot on a frosty morning walk. This snap is a result of proper tempering, which is a process that aligns the cocoa butter and cocoa crystals for a smooth, glossy finish. Allow a small piece of chocolate to melt on your tongue. As it dissolves, what flavors come to the fore? How do the flavors change as you move the chocolate slowly around your mouth? Now close your eyes and exhale through your nose, feeling the flavors levitate off your tongue. Do you taste any new flavors? How long does the flavor linger? Enjoy how the chocolate feels in your mouth. Is it light and fleeting or like a heavy velvet that lingers? What’s the texture – thick and sandy or smooth and silky?